G.R.A.C.E. = God’s Riches at Christ’s Expense. Many of us are familiar with that definition of God’s grace, based on Ephesians 1:7-8. Grace is the free, undeserved goodness and favor of God to mankind. But I’m left wondering: What are those riches? What does God’s goodness look like? The first undeserved favors we might think of include forgiveness, salvation, his peace and presence, guidance and joy. But surely there are more. How many more? I began to keep a list. It currently includes forty-seven aspects of grace. Perhaps you’ll be awed and inspired as I was, contemplating the overwhelming riches that God supplies. All because of the price Jesus paid for us at the cross. Each one deserves careful thought, because each is a precious treasure. I’ll share twenty-three of them today, and the rest on Thursday. You’ll notice they’re organized in alphabetical order. A hierarchy would have been impossible. 1. Unconditional ACCEPTANCE no matter what we’ve done (Luke 15:11-24). 2. Confident ACCESS to God, to talk to him any time, day or night (Hebrews 4:16). 3. Loving ADOPTION into his forever family (Ephesians 1:5). 4. Faithful ATTENTION to our prayers (Psalm 6:9). 5. Rich BLESSINGS to all who call upon him (Romans 10:12). 6. Attentive CARE through life’s ups and downs (1 Peter 5:7). 7. Compassionate COMFORT when we’re afflicted (Isaiah 49:13). 8. Trustworthy COUNSEL, offering guidance for the best way to live (Psalm 73:24). 9. Promised DELIVERANCE on which to set our hope (2 Corinthians 1:10). 10. Strong EMPOWERMENT to do what he asks , which is always in our best interest (Acts 1:8). 11. Continual FAVOR as a child of the King (Proverbs 8:35). 12. Augmented FELLOWSHIP with other Christians (1 John 1:7). 13. Complete FORGIVENESS for our sins (Hebrews 8:12). 14. Liberating FREEDOM from sin, death, worry, and fear (Romans 8:1-2). 15. Satisfying FRUITFULNESS for a productive life (Philippians 1:10-11). 16. 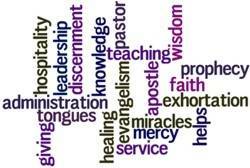 Special GIFTS of the Spirit, not for just a few stellar believers, but for everyone (1 Corinthians 12:1-11). 17. Glorious HEAVEN to look forward to, with a place for each of us (John 14:2-3). 18. Competent HELP that is always near (Psalm 115:11). 19. The powerful HOLY SPIRIT, who is constantly working for us and in us (John 16:13, Romans 8:26-27). 20. Enduring HOPE which renews our strength (Psalm 62:5; Isaiah 40:31). 21. Reliable INSIGHT into God’s Word and how we can apply it to everyday living (2 Timothy 1:7). 22.Overflowing JOY, independent of circumstances (Psalm 16:11). 23. Unfailing JUSTIFICATION, because the God of the universe has declared us “not guilty” (Romans 3:23-24). At the moment each person invites Jesus into his or her life, all of these riches become instantly available. Yet there are more. I hope you’ll be looking forward to Thursday’s list. Thank you Nancy for reminding us of God’s Grace. We are truly blessed. Isn’t it amazing the many, diverse ways he expresses his love! Thank you, Tresa. The list makes my heart soar! It was my prayer that others would be encouraged and uplifted also. YOU are an answer to that prayer! Amazing Grace, indeed. It is a blessing to see this list all laid out, Nancy. Like you wrote at the beginning…salvation and forgiveness immediately come to my mind. But what a treasure trove of gifts we have with His Grace. Looking forward to the next posting. Loved this one, Nancy! Oh, yes, his grace IS a treasure trove. And to think not one of these gifts will EVER run out! So glad the list is a blessing to you. What a wonderful descriptive list you wrote. I couldn’t get past the first one. ACCEPTANCE – seems like I see that all the time now – people crying out just to be accepted as they are, no defense, no excuses, just unconditional love. Always comes down to love, doesn’t it? Indeed–God’s unconditional love for us is a precious treasure!